آمیزه‌های نشاستۀ گرمانرم/پلی‌لاکتیک اسید به‌عنوان مواد کاملاً زیست‌تخریب‌پذیر، قابلیت جایگزینی با پلیمرهای به‌دست‌آمده از منابع نفتی را برای کاربردهای بسته‌بندی و به‌ویژه تولید ظروف یک‌بارمصرف دارا می‌باشند. در پژوهش حاضر آمیزه‌های ذکرشده در حضور سازگارکننده به روش اختلاط مذاب تهیه شدند و تأثیر هم‌زمان فاکتورهای درصد وزنی نشاستۀ گرمانرم گندم در آمیزه در دامنۀ 10 تا 50 درصد و درصد وزنی گلیسرول در مخلوط با سوربیتول به‌عنوان نرم‌کنندۀ نشاسته در دامنۀ صفر تا 100 درصد بر مقاومت کششی، مقاومت ضربه‌ای و رطوبت تعادلی آمیزه‌ها، با انجام آزمایش‌هایی مطابق روش آماری سطح پاسخ بهینه‌یابی شد. مطابق نتایج به‌دست‌آمده، آمیزۀ با مقادیر درصد وزنی نشاستۀ گرمانرم گندم در آمیزه و درصد وزنی گلیسرول در مخلوط با سوربیتول بهینه به‌‌ترتیب برابر با 34/9 و 28/7 درصد، دارای مقادیر مقاومت کششی، مقاومت ضربه‌‌ای و رطوبت تعادلی به‌ترتیب برابر با 28 مگاپاسکال، 25/5 ژول/متر و 14/3 درصد بود. آمیزۀ نشاستۀ گرمانرم/پلی‌لاکتیک اسید با مقادیر درصد وزنی نشاستۀ گرمانرم گندم در آمیزه و درصد وزنی گلیسرول در مخلوط با سوربیتول بهینه به‌‌ترتیب برابر با 34/9 و 28/7 درصد و با فاز نشاستۀ گرمانرم شامل 35 درصد وزنی مخلوط نرم‌کننده با اکسترودر دوپیچه تهیه شد و مقاومت کششی، مقاومت ضربه‌ای و رطوبت تعادلی آن اندازه‌گیری شد. انحراف نسبی داده‌های آزمایشگاهی و مقادیر پیش‌بینی‌شده توسط مدل‌های رگرسیونی برای مقاومت کششی، مقاومت ضربه‌‌ای و رطوبت تعادلی آمیزه به‌ترتیب برابر با 4/4، 2/4 و 10/6 درصد بود. Arboleda, G.A., Montilla, C.E., Villada, H.S., & Verona, G.A. 2015. Obtaining a flexible film elaborated from cassava thermoplastic starch and polylactic acid. International Journal of Polymer Science, Article ID 627268. ASTM International. 2010. Standard test methods for determining the izod pendulum impact resistance of plastics, No, D256-10e1. ASTM International. 2002. Standard test method for tensile properties of plastics, No, D638-02a. Auras, R., Harte, B., & Selke, S. 2004. An overview of polylactides as packaging materials. Macromolecular Bioscience, 4(9):835-864. Dole, P., Joly, C., Espuche, E., Alric, I., & Gontard, N. 2004. Gas transport properties of starch based films. Carbohydrate Polymers, 58(3):335-343. 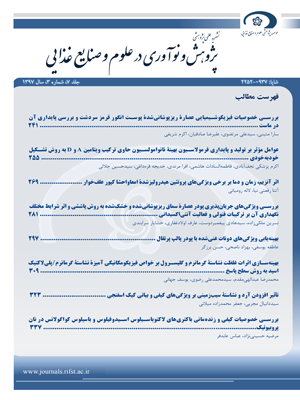 Ebrahimi, H., Afshar Najafi, F.S., Seyed Shahabadi, S.I., & Garmabi, H. 2016. A response surface study on microstructure and mechanical properties of poly (lactic acid)/ thermoplastic starch/nanoclay nanocomposites. Journal of Composite Materials, 50(2):269-278. Huneault, M.A., & Li, H. 2007. Morphology and properties of compatibilized polylactide/ thermoplastic starch blends. Polymer, 48(1):270-280. Iovino, R., Zullo, R., Rao, M.A., Cassar, L., & Gianfreda L. 2008. Biodegradation of poly (lactic acid)/starch/coir biocomposites under controlled composting conditions. Polymer Degradation and Stability, 93(1):147-157. Li, H., & Huneault, M.A. 2011. Comparison of sorbitol and glycerol as plasticizers for thermoplastic starch in TPS/PLA blends. Journal of Applied Polymer Science, 119(4):2439-2448. Lorcks, J. 1998. Properties and applications of compostable starch-based plastic material. Polymer Degradation and Stability, 59(1-3):245-249. Lu, D.R., Xiao, C.M., & Xu, S.J. 2009. Starch-based completely biodegradable polymer materials. Express Polymer Letters, 3(6):366-375. Mugnozza, G.S., Schettini, E., Vox, G., Malinconico, M., Immirzi, B., & Pagliara, S. 2006. Mechanical properties decay and morphological behavior of biodegradable films for agricultural mulching in real scale experiment. Polymer Degradation and Stability, 91(11):2801-2808. Muller, C.M.O., Pires, A.T.N., & Yamashita, F. 2012. Characterization of thermoplastic starch/poly (lactic acid) blends obtained by extrusion and thermopressing. Journal of the Brazilian Chemical Society, 23(3):426-434. Nampoothiri, K.M., Nair, N.R., & John, R.P. 2010. An overview of the recent developments in polylactide (PLA) research. Bioresource Technology, 101(22):8493-8501. Phetwarotai, W., Potiyaraj, P., & Aht-Ong, D. 2012. Characteristics of biodegradable polylactide/ gelatinized starch films: effects of starch, plasticizer, and compatibilizer. Journal of Applied Polymer Science, 126(S1): E162-E172. Polystyrene (PS). Typical properties generic PS. Visited in June 2017. Available online at: https://plastics.ulprospector.com/generics/43/polystyrene-ps. Ren, J., Fu, H., Ren, T., & Yuan, W. 2009. Preparation, characterization and properties of binary and ternary blends with thermoplastic starch, poly (lactic acid) and poly (butylene adipate-co-terephthalate). Carbohydrate Polymers, 77(3):576-582. Sanyang, M.L., Sapuan, S.M., Jawaid, M., Ishak, M.R., & Sahari, J. 2015. Effect of plasticizer type and concentration on tensile, thermal and barrier properties of biodegradable films based on sugar palm (arenga pinnata) starch. Polymers, 7(6):1106-1124. Souza, R.C., & Andrade, C.T. 2002. Investigation of the gelatinization and extrusion processes of corn starch. Advances in Polymer Technology, 21(1):17-24. Spiess, W.E.L., & Wolf, W.R. 1983. The Results of the COST 90 project on water activity. P. 65-91. IJowitt, R. Escher, F. Hallstron F.B. Meffer, M.F. Spiess, W.E.I. Aos, G. (eds.) Physical properties of foods. Applied Science Publishers, London. Stepto, R.F.T. 2003. The processing of starch as a thermoplastic. Macromolecular Symposia, 201(1):203-212. Teixeira, E.M., Pasquini, D., Curvelo, A.A.S., Corradini, E., Belgacem, M.N., & Dufresne, A. 2009. Cassava bagasses cellulose nanofibrils reinforced thermoplastic cassava starch. Carbohydrate Polymers, 78(3):422-431. Wang, N., Yu, J., & Ma, X. 2007. Preparation and characterization of thermoplastic starch/PLA blends by one-step reactive extrusion. Polymer International, 56(11):1440-1447. Yang, J.H., Yu, J.G., & Ma, X.F. 2006. Study on the properties of ethylenebisformamide and sorbitol plasticized corn starch (ESPTPS). Carbohydrate Polymers, 66(1):110-116. Yokesahachart, C., & Yoksan, R. 2011. Effect of amphiphilic molecules on characteristics and tensile properties of thermoplastic starch and its blends with poly (lactic acid). Carbohydrate Polymers, 83(1): 22-31. Yu, L., Dean, K., & Li, L. 2006. Polymer blends and composites from renewable resources. Progress in Polymer Science, 31(6):576-602. Zhang, K.Y., Ran, X.H., Zhuang, Y.G., Yao, B., & Dong, L.S. 2009. Blends of poly (lactic acid) with thermoplastic acetylated starch. Chemical Research in Chinese Universities, 25(5):748-753. Zhang, Y., Yuan, X., Liu, Q., & Hrymak, A. 2012. The effect of polymeric chain extenders on physical properties of thermoplastic starch and polylactic acid blends. Journal of Polymers and the Environment, 20(2):315-325.